Update: Build 14986 is now rolling out for Windows insider members. The latest Windows 10 Creators Update (Redstone 2) PC build 14986 is now available to fast ring insiders. Previously, the company released Windows 10 PC build 10.0.14965 and mobile 10.0.14977.1000 for insiders. The company will release insider mobile build next week. 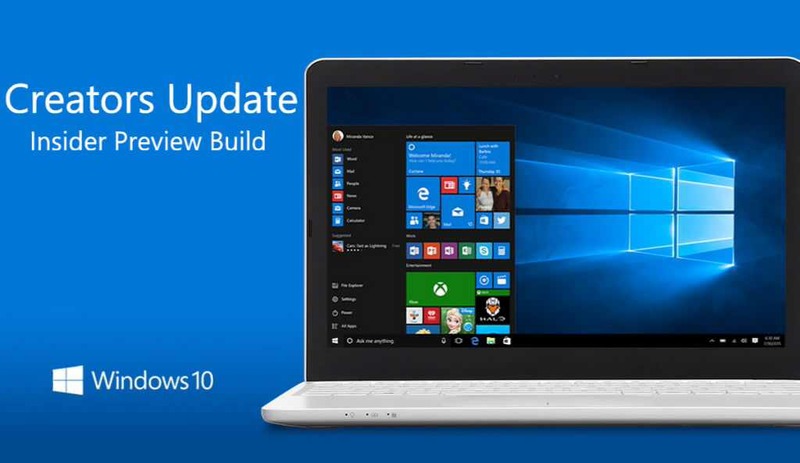 New build 10.0.14986 comes with many new features and fixes. Check out the official changelog below. Turn off your computer, change volume with voice commands: Now you can shut down your PC just by asking Cortana. You can also restart, lock, or put the system to sleep, and raise and lower your system volume with just your voice. Cortana loves music: You can now use Cortana to control music playback on more of your favorite music apps (EN-US only). Enabled natural language compatibility for iHeartRadio and TuneIn Radio. Cortana sign-in using Azure Active Directory (AAD) identity: This capability will allow you to sign into Cortana with your work or school account instead of your MSA, enabling you to use Cortana even if your organization does not support MSA. Full screen when Idle: When your PC is in an idle state, asking Cortana questions will result in a gorgeous full-screen experience that is optimized for far field viewing! Enterprise Cloud Printing: The new Enterprise Cloud Printers discovery UI under Settings > Devices > Printers & scanners will enable corporate users to discover corporate printers when on Azure Active Directory joined devices when the IT admin deploys and configures the backend services. Windows Game Bar improved full-screen support: Insider team added support for 19 additional games in full-screen mode with Windows game bar in build 14986. New Extensions in Microsoft Edge: New extensions are now available for Windows 10 Edge browser. You can download it from here Ebates, Intel TrueKey, and Read & Write. Updated Rendering Technology: Insider team changed the rendering technology used for many types of UWP app content in build 14986. Narrator has a new feature to give you additional information about fonts, colors, line spacing, margins and more. Press Caps Lock + F to hear this information. Continue to press Caps Lock + F to cycle through nine categories of information. Use Shift + Caps Lock + F to move through these categories in reverse. The default level for a Narrator feature called Context Awareness is now set to 2. You will hear additional information as you move around areas such as the Start Menu, Office ribbon and more about the areas you are in. Use Alt + Caps Lock + / to cycle through the different options. Zero means off for the feature. The key to get advanced information about the item with focus has been changed to Caps Lock + 0 from Caps Lock + F in Narrator. Build 14986 fixed an issue from recent flights where Narrator would only say “No item in view” when placing focus on the Start menu tiles. 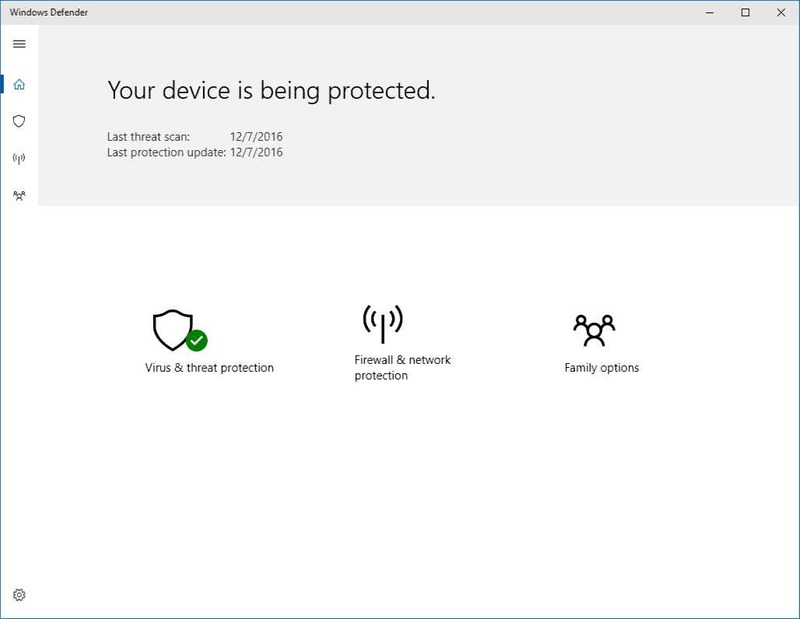 New Windows Defender dashboard: Build 14986 making it easier for you to view and control Windows 10 device security and health features available on your PC or tablet with the availability of a new dashboard coming in the Windows 10 Creators Update. Windows Insiders will get a preview of the new experience beginning today. Registry Editor improvements: Build 14986 added the familiar File Explorer keyboard navigation shortcuts to Registry Editor, so you can now easily go up (Alt+ Up arrow), backwards (Alt + Left arrow) or forwards (Alt + Right arrow) in the registry. build 14986 also added a new entry point in the View menu so you can customize the font Registry Editor uses. The USB Audio 2 Class Driver : Previous builds flighted to Windows Insiders have contained a Microsoft class driver for devices that support the USB Audio 2.0 standard. However, if you had a third-party driver which was specifically written for your device, Windows would use that instead. In order to get more miles on the class driver, we are temporarily changing things as of 14986 to prefer the class driver over third-party drivers – this is so we can flush out device compatibility issues and other bugs in our driver. Involving you more when specifying a time to update: In build 14986 If Windows Update in unable to find a good time to restart your machine to apply the latest updates, you will now get be prompted to “restart now”, “Schedule” a time that works for you, or simply “Remind me later” which will not apply the update but offer you these options again. 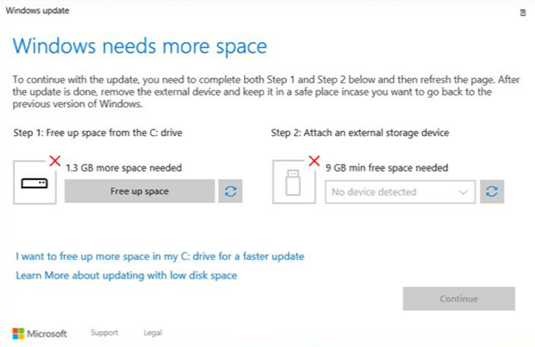 Making it easier to free up space for upgrading: Sometimes PC disk drives fill up. When they do, you have to clear up space in order to install the latest update. Previously, this could be a bit of a hassle, build 14986 ha simplified the process to help you through it and polished it up a bit along the way, so you can easily see how much space is needed, what your options are for creating it, and then make it happen. This updated Windows 10 setup page will be displayed in white when you encounter this issue while upgrading using Windows Update and in blue when upgrading using an ISO. New Windows Ink features: Build 14986 includes new features for Windows Ink. Resuming previous screen sketches: With Build 14986 you can now resume previous sketches! By default, when you open Screen Sketch, it will always open to a new screenshot, but now you can click on the Resume button and it will take you back to the sketch you were working on when Screen Sketch last closed. Updated Ink Flyout Visuals: The Windows Ink pen, pencil and highlighter flyouts now show a preview of what it would look like to ink with the currently selected color and width. This improvement will be visible in any app that uses Windows Ink with the Windows 10 Creators Update SDK. Build 14986 also updated the flyouts so that they’ll no longer show what appear to be duplicate color entries when in high contrast, now support using the Esc key to close the flyout, and have returned the flyout to dismissing once you tap a color or change the width (rather than staying open until you manually close it). Polishing your inking experience: The cursor will no longer be shown while you’re inking. Original Story: Microsoft will delay next insider build as the company will release PC build using Unified Update Platform (UUP). Mobile builds are not impacted by this. Meanwhile, Build 14986 is now under testing. Windows 10 Creators Update (Redstone 2) build 14986 and mobile build 10.0.14986.1000 were compiled on December 2, 2016.